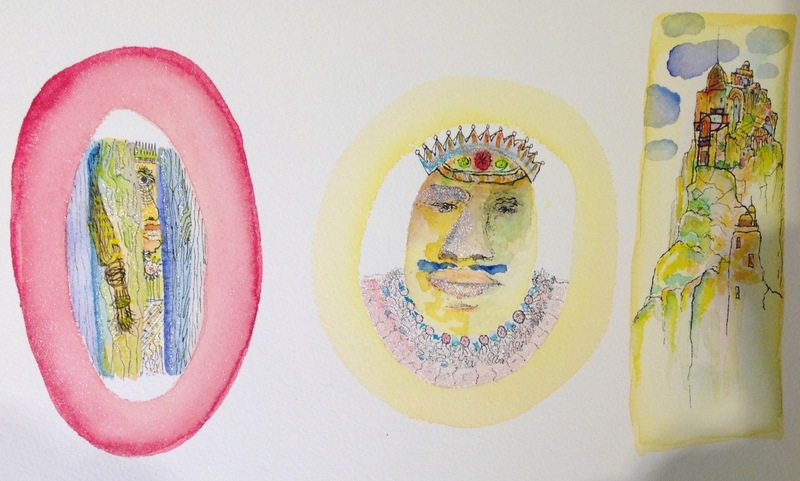 This fantastical painting of a king–according to Scott–just came to him out of thin air. But when I googled ‘kings and kingdoms” a wiki link about King Pandukabhaya and nearby Sri Lanka came up immediately, leaving my mind to wander and wonder….could my Prince of Goa be channeling ancient rulers as well as attracting mystical magic? Why not…this is India where anything is possible….just close your eyes. Or open them wide and look far into the worlds within worlds of Scott Morgan’s paintings. Let the details pull you in deeper. Hear the chanting…smell the incense…feel the breezes on your cheek…the Arabian sea stretches before your eyes….time expanding and contracting all around you….my prince. This entry was posted in Uncategorized and tagged art, artist, Going to Goa Blog, imagination, king pandukabhaya, Scott Morgan, sri lanka, traveling with cancer, Watercolor painting. Bookmark the permalink.